It is said that Akbar, who was a staunch vegetarian, loved his Mirch Ka Salan not only for its unique taste, but also for the flavour integration that the dish had. Circa 1498: Vasco Da Gama lands in India, and with it lands the one condiment that for ages thereafter would remain symbolic to the Indian cuisine- Green Chillies or Pimiento Verde to be precise. Little did the Portuguese voyager, who had offered the precious saplings wrapped in moss for a welcome stay at the port, know then that one day his ‘little gift’ would be turned into an iconic side dish by an equally iconic dynasty. The dish was Mirch Ka Salan, and the dynasty were the Nizams. For him then, chillies – which he picked from Spain, Brazil and Africa – served two means. First as a currency to take home the gold of all spices- pepper; and two to help recreate a little Portuguese island on this prosperous land. The plan worked. Unlike pepper, which was expensive and unaffordable to the larger populations then, green chillies came in cheap, grew easily on Indian soil and added the right pungency to a dish to make it more addictive. And just like that chilli became the proverbial green card for Gama and his sailors to set shop in the country as traders of course. It also helped them recreate the dishes that he and his crew had taken fancy to and adopted during his travels, namely Pork Sorpotel (from Brazil), Chicken Cafreal (Africa) and Poi, which back then was a maida-based bread that the native Goans turned and made into a wheat-based bread fermented with home-made palm toddy. But the chillies did more than just conquer the tastebuds of the Goans. With traders, it moved inside the expanse of the country and reached every kitchen – including that of royals – to give food, which till then survived on pepper to give that extra spicy punch, the right kind of spiciness. It was somewhere between the 14th and the 15th century that India began producing different varieties of chillies – thin, broad, thick, wrinkled, small pebbles kind and of course dried red varieties too that could be used for colour and heat. The choices combined with the ingenuity of the khansamas, who were constantly on the lookout for creating something outstanding, resulted in some of the most unique dishes come forth. Like the Rogan Josh, which has a combination of mildly flavoured chillies, the Pork Vindhalo that uses the heat of two different chillies, the Laal Maas, which got its blood-red look not from tomatoes (another vegetables that the Portuguese got to India) but from Mathania Mirch. And then there was the king of all, the Mirch Ka Salan – one of the masterpieces of culinary India at that time, which used three different techniques, including that of pickling to create a dish that used a spice as a main ingredient rather than a flavouring. In fact, Mirch Ka Salan is perhaps one of the few dishes that bring together the nuances of Telangana, Karnataka and Marathwada style of cooking. In other words the use of various masalas with a souring agent like tamarind. 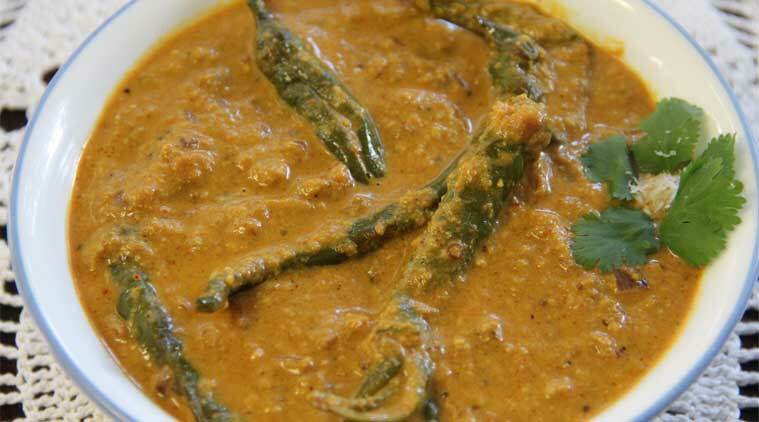 So how and where did the Mirch Ka Salan originate? While many believe that it was in Akbar’s court from one of his skilled khansamas, given the mention of Mirch Ka Salan as one of the highlights of menu served at Akbar’s coronation ceremony as the Emperor Of India. Even the Ain-i-Akbari mentions the dish as his favourite. In one of the pages, it is written that an edgy prince (referring to Akbar) was pleased to see that his favourite Mirch Ka Salan on the rehearsal dinner menu with Mir Bakawal, who reminded the prince how his beloved dish is an adaptation of a popular Indian cooking practice which the kitchen has embellished with local spices, condiments and souring agents from regions all over the kingdom – making something altogether unique. However, it would be wrong to assume that the Mirch Ka Salan came from the kitchen of the royal corridors. Akbar’s kitchen was never as elaborate as his successors who took a deeper interest in developing culinary wonders. Akbar, noted Colonel H S Jarrett, who later translated the volumes into English, was a man of frugal dietary habits and enjoyed dishes that were simple. The Mirch Ka Salan could, as presumptions go, well be the exception. There is, though, a good possibility that one of the Jagirdars under the Emperor could have developed the recipe. Unequal in power but comparable in wealth, the Jagidars were rather fond of entertaining the emperors and other seniors in power and position during the time. And it could be well possible that one such feast could have seen the birth of Mirch Ka Salan, which eventually reached Akbar’s court. And while there can only be speculations as to who that Jagirdar/s were – with some suggesting the predecessors of Asaf Jahi, who is credited of developing the Hyderabadi cuisine, as one of the contenders — there was no denying that Mirch Ka Salan was never developed as a side -kick to Biryani as it later became. Food lores also suggest that the dish came during the time of Muhammad Quli Qutb Shah, the fifth ruler of the Qutb Shahi dynasty, founded the city of Hyderabad in 1591, who was known to be rather fond of bold flavours in his food. Of course, the first iteration of the dish looked very different from what you see today. The gravy because of the use of tamarind was a deep shade of brown and the Mirch was kept slight al dente for the crunch and sweetness. It was during the time of Asaf Jahi, that the Salan underwent a change and became the way it is presented today. A good Mirch Ka Salan is the brownish one, which is still made in the traditional way. It has fried onions with well pounded chironji and almonds. Then the paste of ginger, garlic and garam masala is added along with tamarind with long fat Bhavnagri Mirch, which had gained popularity because of the right mix of sweet and heat content and of course to Gujarati traders who took it along as pickled vegetables. Of course, later on, probably to suit the palate of the British, a whitish Mirch Ka Salan also made its debut, which was made without the tamarind but kharna, a bigger citrus fruit which is rarely found these days. However that didn’t get much popularity as the former – and thus the traditional Mirch Ka Salan remained the stately dish under Asaf Jahi who served it as his signature dish to visiting dignitaries and guests. It is said that the Jahi dynasty became so obsessive about the dish that the recipe made it into the official Will of the Nizams that was only passed on to the daughter-in-laws so the key to making the best Mirch Ka Salan remained with them.